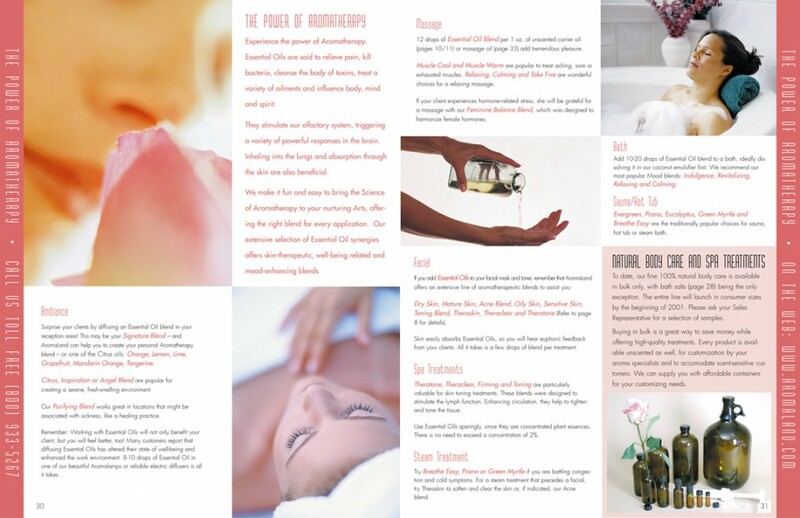 Our lush product photography formed the basis for this self-mailing brochure. 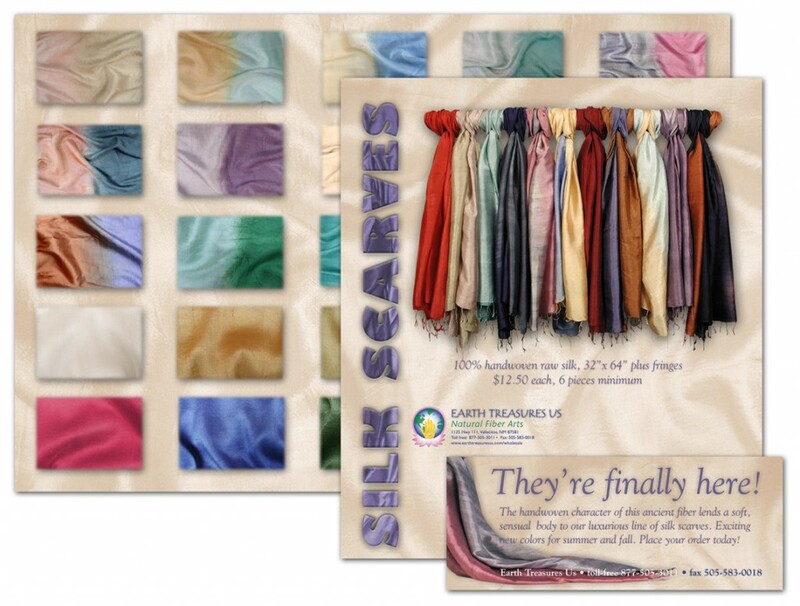 Targeting retailers, this piece is all about feel — the feel of raw silk. 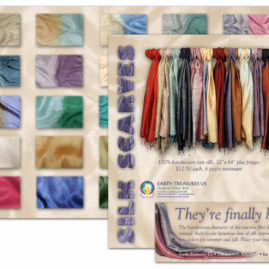 The back of the brochure is a palette of the 25 available colors. How can you not buy something when it looks this good? 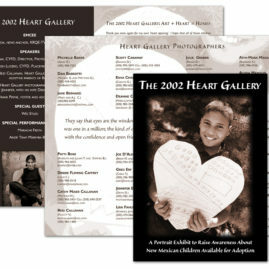 Foster care and adoption agency event brochure, in sepia tones. We found a charming old wood inlay frame, photographed it, and manipulated it on the computer. A closeup of the couple’s hands makes a second and third appearance on the inside. 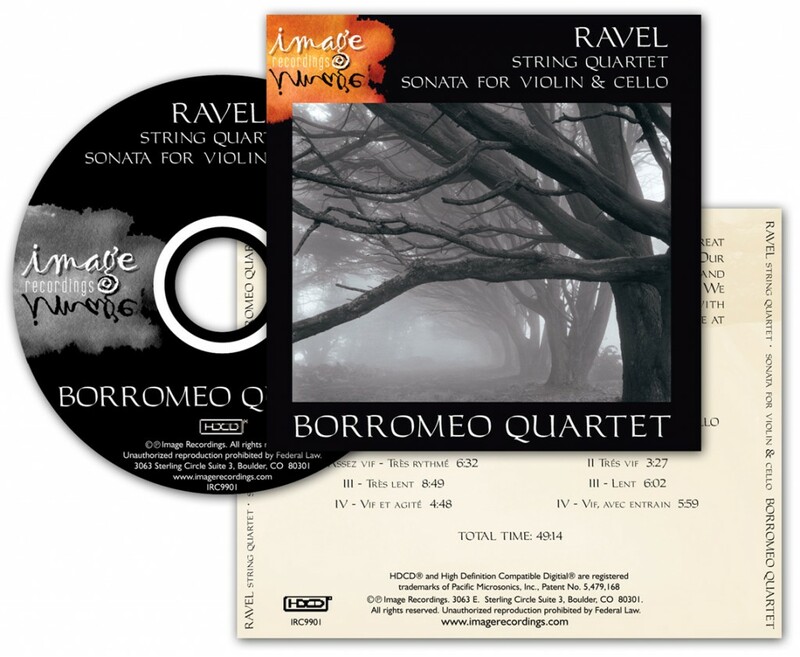 The resulting package is one that conveys intimacy, and has a very “touchable” quality. 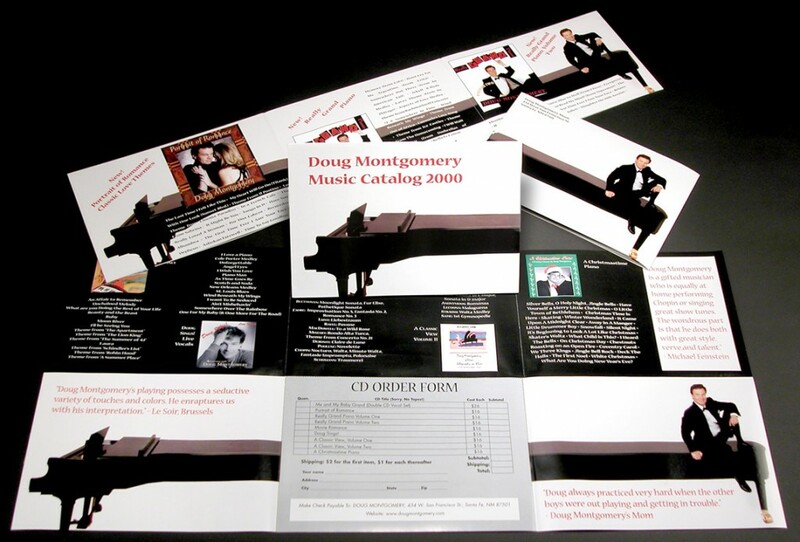 Doug Montgomery’s CD brochure, from back in the day. We photographed his Baldwin grand in our studio. Someone else photographed him. We put it all together, and stretched the piano out, to make a “grand” statement. 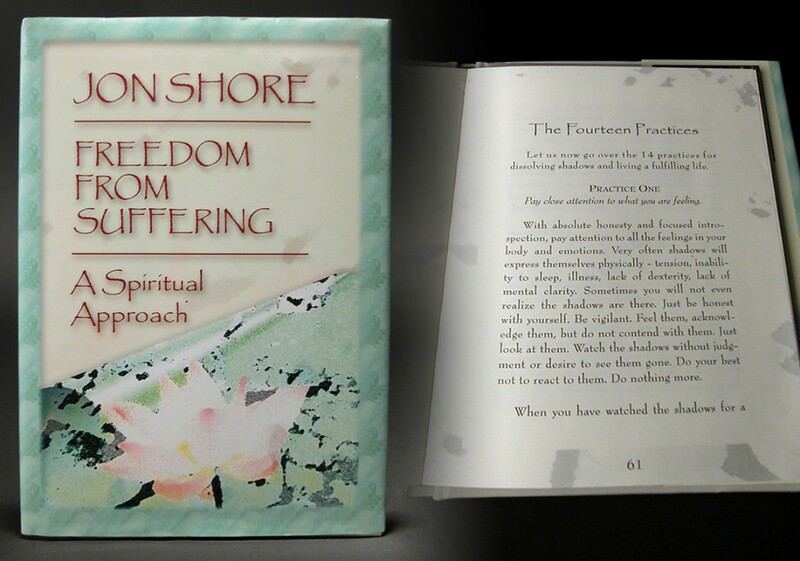 We began this book design with a lotus blossom, and curled the image back for a 3D effect. The page curl invites the browser to “look inside”. 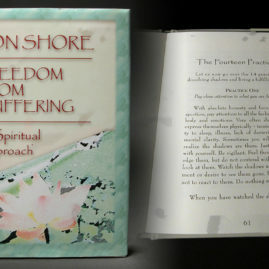 The “stucco” effect behind the type was derived from the lotus image. 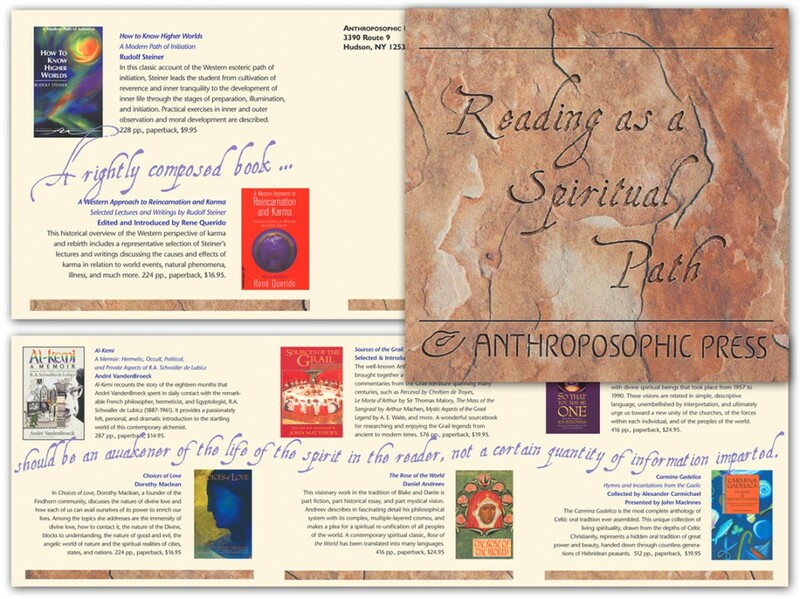 We reprised the texture for the book’s page design. It’s a very elegant little book. 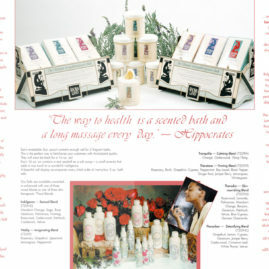 A two page spread from a catalog of scented products for women. Clean typography, pastel colors, and beautiful images combined to form a very pleasing layout. 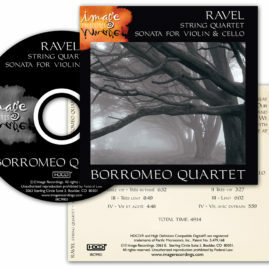 Despite the fact that a great deal of information is packed in, the whole catalog has a fresh, open and inviting feel. 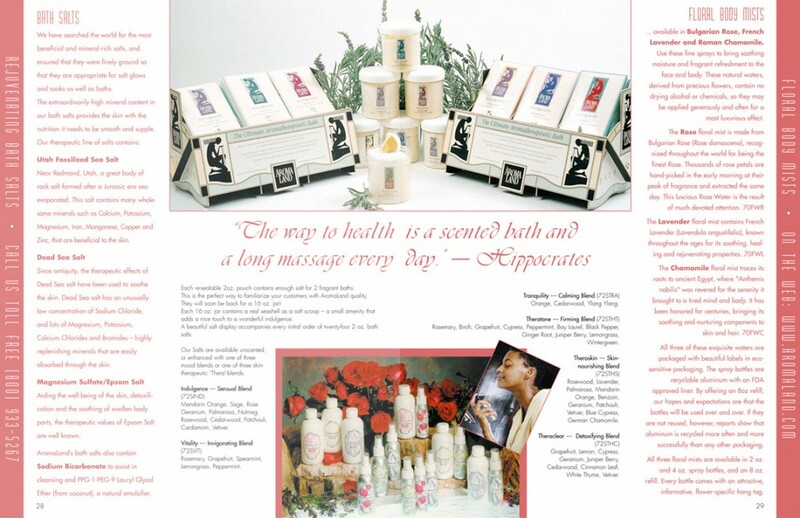 Another spread from the same catalog, this one featuring hand made soaps. 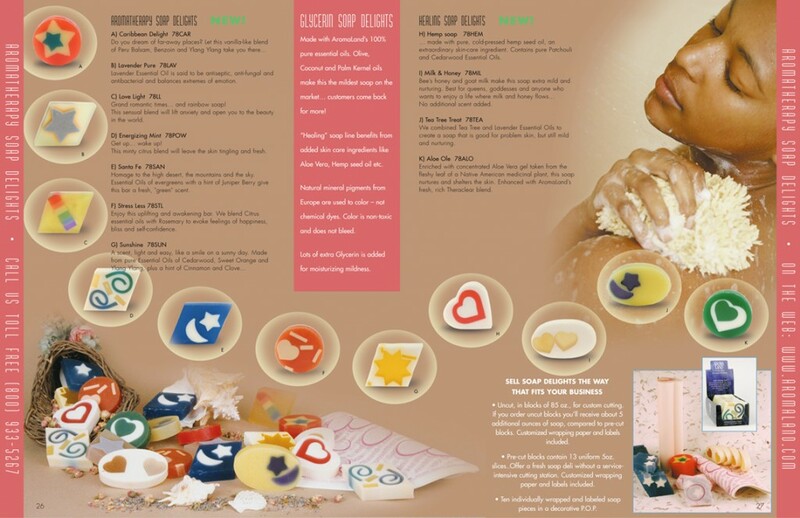 Here we created a “bubble” effect around all of the soap varieties, for a fun look. You could say it’s a very “clean” design. Pretty, pretty, pretty. 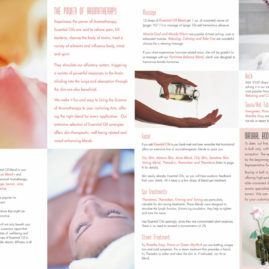 Stock photography images and artful typesetting make this spread appealing. The outstanding photography featured on the cover we can’t take credit for. Out job was to make it all look great, so that’s what we did. 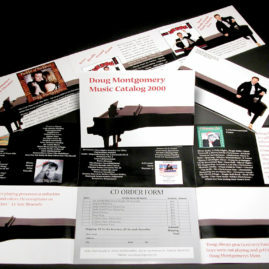 A self-mailing catalog for a publisher. We used a special piece of flagstone for a timeless look. The title is “etched in stone”, and the stone reappears throughout the piece. 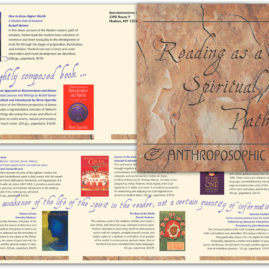 A quote from this publisher’s leading author flows through piece, providing a sense of rhythm. 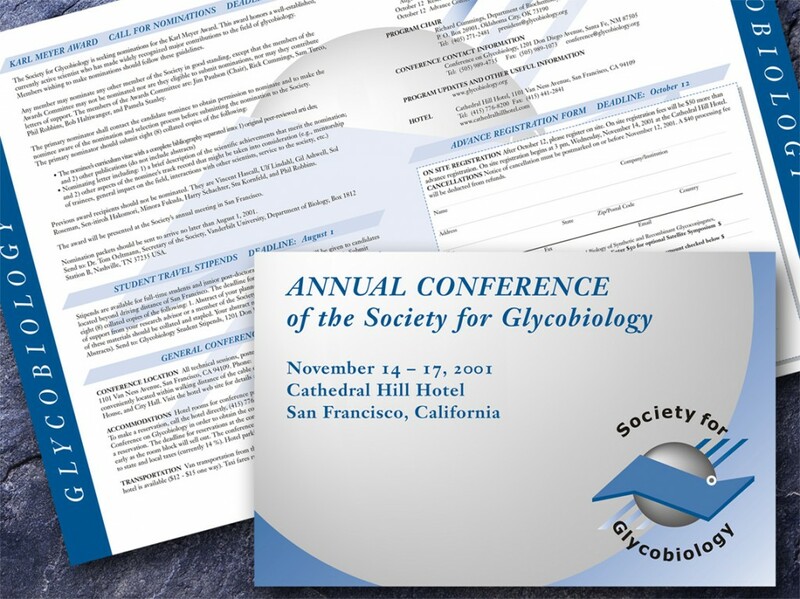 Through creative use of existing photography and artful typesetting, we developed this stunning brochure. This piece especially appeals to the wealthy women over 30 that make up the bulk of our client’s market. 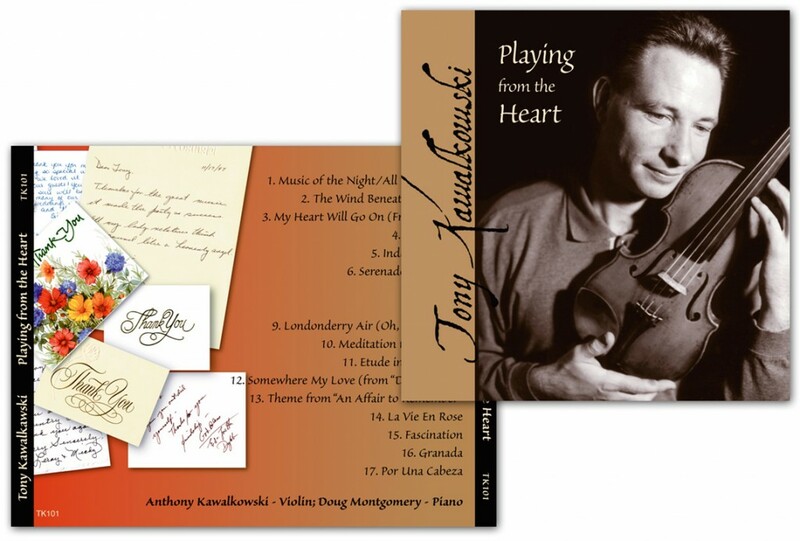 Tony gets a LOT of thank you notes from his wedding performances. 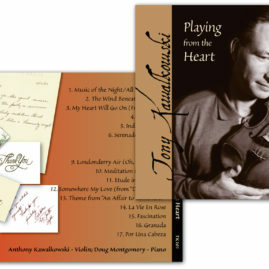 So we used them in a collage in designing his CD tray card. 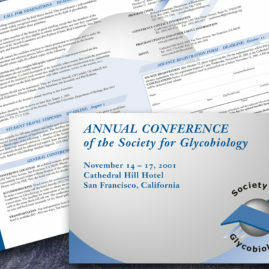 We’ve done projects for a number of science organizations. This one is called “smallTalk”. 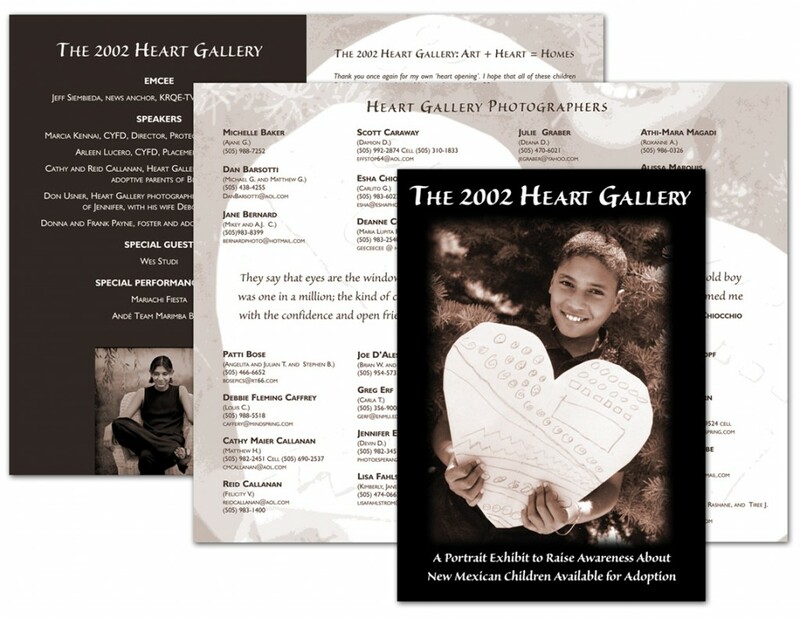 Here we used microchip imagery to lend visual impact. Lots of typesetting is involved in these projects. 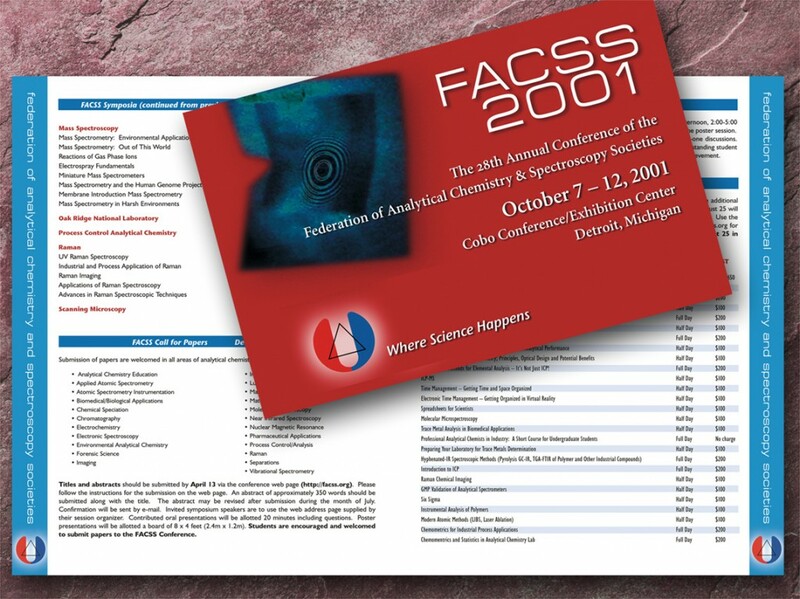 The key is organizing and arranging the material so it’s attractive, clean and easy to read. 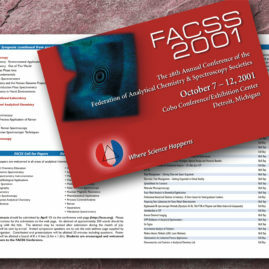 For this science conference brochure we began with the blue image provided by the client. We did a good bit of enhancement and color work to liven it up, and built the rest of the piece from there. Their logo provides a visual anchor for the cover, and for the sidebars inside. What do you suppose makes good design good? 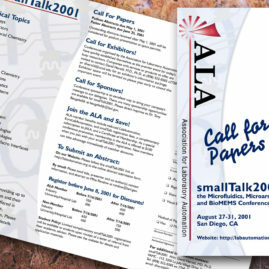 Let’s assume your designer has a strong grasp of composition and form, possesses an in-depth understanding of type, has a way with color, is fluent in all the usual software, can adapt to a wide variety of styles and media, and has a superhuman ability to pull compelling, creative ideas out of thin air. Would that do it? 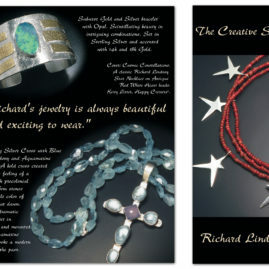 Link the character of the design to the personality of the client. Target the personality of the design to the taste of the target audience. 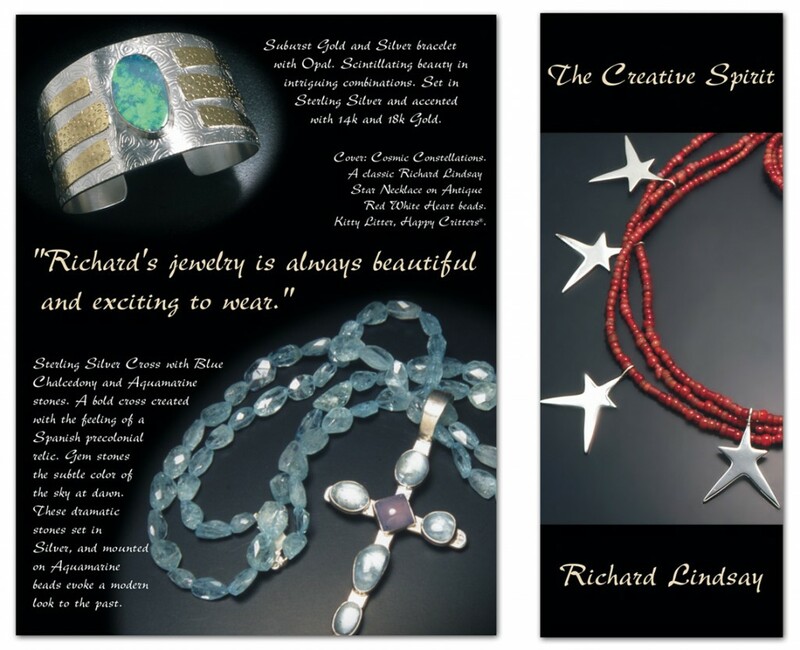 As you view our portfolio, please observe how the character of each piece matches the intent behind it. Different kinds of projects should look, well, different! 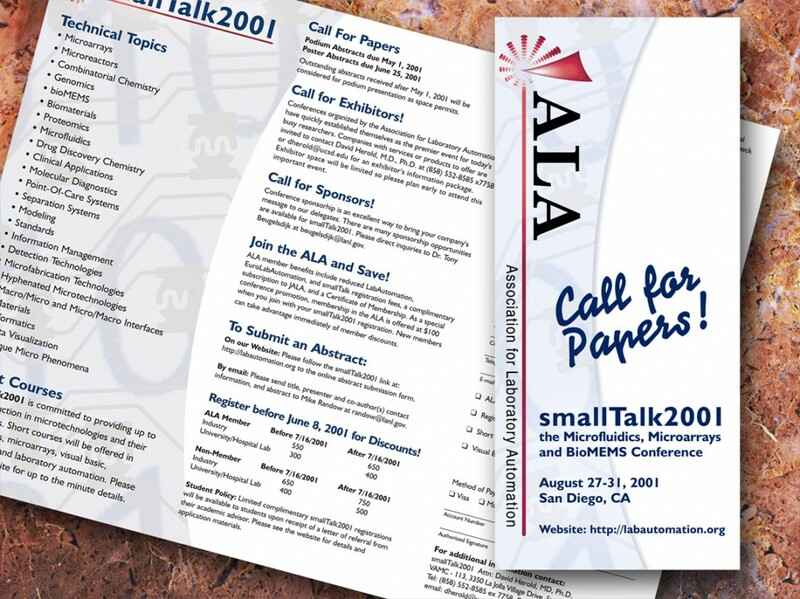 When you need graphic design in Santa Fe, contact us.